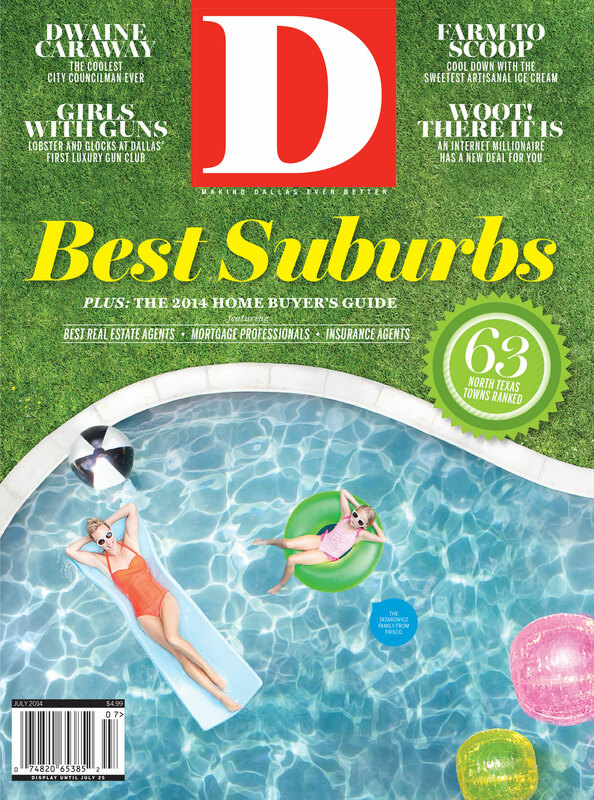 By D Magazine | 5 years ago Where does your community fall on the list? By Tim Rogers | 5 years ago Matt Rutledge, the man who invented the deal-a-day concept with Woot.com, launches his next venture: A Mediocre Corporation. By Jessica Roberts | 5 years ago It brings a whole new caliber of luxury to the pistol-packing set. By D Magazine | 5 years ago As chosen by their peers, home buyers, and D Magazine subscribers. By Zac Crain | 5 years ago A tour of District 4 with the most trill councilman ever. By Cristina Daglas | 5 years ago Heather Wiese Alexander offers her guide to some of the city’s finest home stores, gallery spaces, and restaurants. Quiz: Which Dallas Suburb Is Right For You? By D Magazine | 5 years ago Ten questions to tell you which of our 10 best satellite cities you should call home. By D Magazine | 5 years ago Our methodology for comparing densely populated apples to large-lot-size oranges. By Bradford Pearson | 5 years ago How these students built a champion robot. By Michael J. Mooney | 5 years ago The Lodge’s owner was tired of seeing her dancers waste their money. So she called in an expert. By Tim Rogers | 5 years ago David Mimlitch and his toy plane discovered what Columbia Packing Company was dumping into the Trinity River. By Eric Celeste | 5 years ago Terdema Ussery did it in his spare time. By Liz Johnstone | 5 years ago Who says Socrates and Chantilly lace don't mix? By D Magazine | 5 years ago Individual agents with a 2013 sales volume of $10 million or more. By Nancy Nichols | 5 years ago The Trinity Groves restaurant is finally on track. Restaurant Review: Monkey King Noodle Co.
By Carol Shih | 5 years ago Andrew Chen does things old school in his Deep Ellum stand. By Nancy Nichols | 5 years ago A revamp of its flagship proves the Southwestern cuisine chain is as relevant as ever. By Todd Johnson | 5 years ago The Design District spot no longer ranks among the city's top places to dine. By Tara Nieuwesteeg | 5 years ago There’s nothing exciting about this White Rock Lake spot. That’s the point. By Nancy Nichols | 5 years ago A Fort Worth woman ditches her day job to create edible art. By Zac Crain | 5 years ago It involves an owl. By Bradford Pearson | 5 years ago She had to spend a little time behind bars. Now she’s launching some of the hippest places in Dallas.